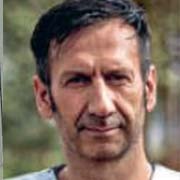 Luis Encinas is a nurse from Spain working in MSF’s Ebola treatment centre in Butembo, Democratic Republic of Congo. These are excerpts from the diary I kept. The stories are all true. Only the names have been changed to respect the patients. Writing my diary is a kind of therapy. I do it to convey my daily life to my loved ones and also to record powerful, perplexing, true stories. Stories about human beings, like you and me. North Kivu is a province in the east of the country perched on a volcanic massif, with flora as green as it is intense. It is hard to imagine that there has been an Ebola outbreak here for almost three months. Apart from Ebola, people’s biggest concerns here, going back 20 years, are insecurity, internal conflicts and being forcibly displaced from homes and livelihoods. It’s funny getting dressed; I have a smile that slips inside my suit with me. I’ve brought with me a toy jeep – the kind that has a cord you can pull and release, powering the jeep so it goes along on its own. And I’ve made a little balloon by inflating a disposable latex glove. I draw on two eyes, a big smile and lots of curly hair. These are my last gestures for Bienvenu, because he leaves tomorrow. Inside the Ebola treatment centre, while doing rounds with the patients who have suspected Ebola, I have only one desire: to rush to the end of the room, where I’ll find Bienvenu. This little boy can’t be more than 4 ft high, his eyes are remarkably beautiful, and when he smiles it lights up the world around him. He is waiting for us, lying in his bed under a multicoloured blanket. His mum, a survivor of Ebola, is lying next to him. It’s been almost three weeks since he arrived here. I remember perfectly the first time I met him. Scared, alone in bed, he refused even to look at me. I approached slowly, but it was as if my presence terrified him. I waved and tried to say something in Swahili. And bit by bit he began to smile. 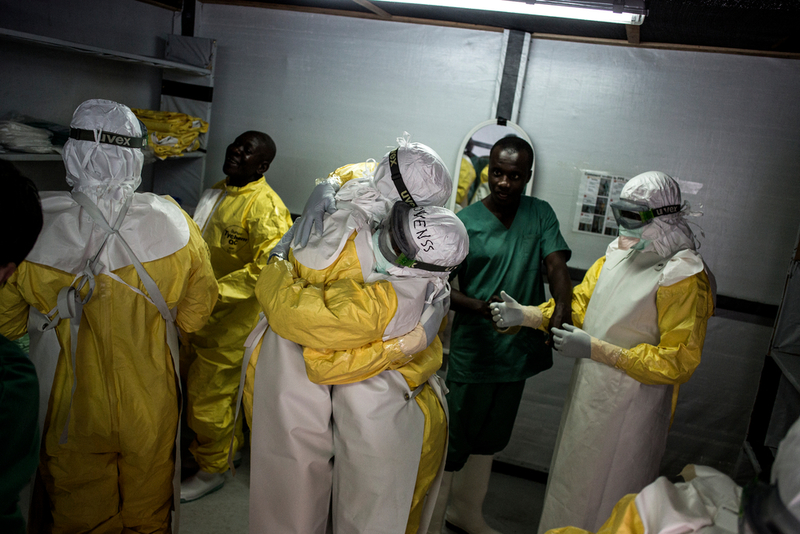 "We all wear protective suits in the Ebola treatment centre. Sometimes I draw small butterflies on my white hood; I learned to doodle them with my children at home." I tried to find a ball but the next day I was told it was not possible because it’s too dangerous to kick a football in the Ebola treatment centre. It’s true that it’s too dangerous, but it’s in moments like these, when we are unwell, that we just want to distract ourselves, to invent or to create something. Staff members embrace in the dressing room before starting a new shift. I returned the next day with this little toy jeep and this handmade ‘ball-glove’ that Mustapha made me pass through the wooden chute, which connects the two zones of the Ebola treatment centre and is used to pass materials from one zone to the other. The chute only goes one way, because the risk of infection means that nothing that goes into the high-risk zone can come out again (except to be destroyed or burned). So, as the moment to say goodbye crashed over me like a wave, I gave him a quick hug. Before I left, I also gave Bienvenu a writing slate and some sheets of white paper. In an instant he drew a little man and a house. I can assure you that this drawing will remain engraved forever in my memory, and the smile of the guy in the drawing was as wide as that of the young draughtsman. Crowning all of this, his test result for Ebola came back negative. Every time I think of him, I feel that energy and that serenity that does you so much good. Here in the Ebola treatment centres, it’s much needed. Four children and a husband at home, plus her little sister and dad. I don’t dare ask if her mother is alive or living elsewhere for fear of hearing another story of a family separated. Her neighbour, who is convalescing, comes to stand next to me. She brings her plate and whispers something in Swahili. “She must eat. She must gain strength. She must live!” She speaks with conviction. The next day, Espérance is bedridden, moaning in pain and clutching her abdomen. I take her hand. She throws it aside and turns towards the other side of her bed. She won’t speak to me. I am trying to take her vital signs during the necessary time period to monitor her antiviral treatment. But I get the impression that Espérance has taken another path.There is a heavy, oppressive atmosphere, and I have some difficulty concentrating on my work. I have the impression that we no longer speak the same language. The next day, Espérance is no longer with us. The night before, her condition had deteriorated very quickly. Another nurse, another colleague, who is leaving this world, simply for trying to provide care in conditions that were far from optimal. Six months after the declaration of the Ebola epidemic in northeast Democratic Republic of Congo, teams are still working to gain control of the outbreak. So far, 619 people have been infected with the virus and 361 have died. 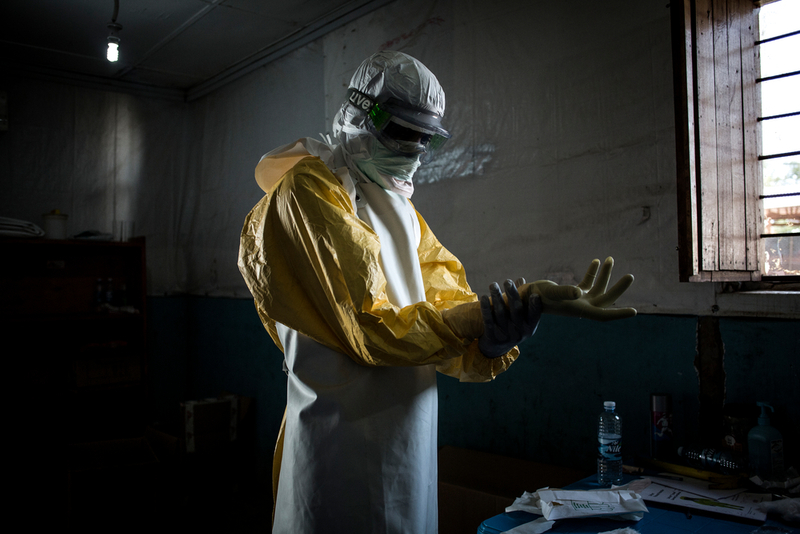 MSF is running Ebola treatment centres in the towns of Butembo and Katwa, transit centres in Beni and Bwana Sura and an isolation centre in Bunia. MSF has also assisted with the vaccination of frontline health workers and is carrying out infection-prevention activities and awareness-raising activities among health workers and affected communities.